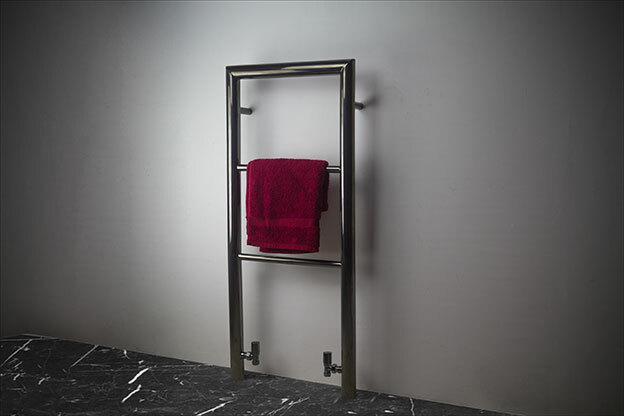 This black chrome heated towel rail is floor mounted and available in 2 sizes. Manufactured in high quality stainless steel with a hard-wearing black chrome finish, these towel rails are built to last. Designed and made in Britain exclusively for Livinghouse, this black chrome bathroom radiator has a thicker outer frame for a unique, modern towel rail design that allows plenty of hanging space. Supplied for central heating, electric or dual fuel heating systems. • Electric elements are hidden. • Made to special order - please allow 6 weeks. • Prices include U.K. mainland delivery.